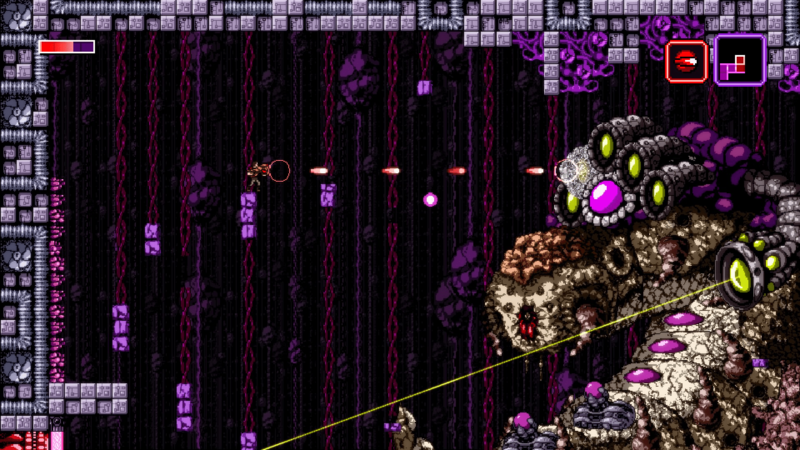 Axiom Verge has been announced for the Xbox One and Wii U on the eShop. This action style platform game is 16 bit and allows you to scramble enemies, corrupt environments, and enter hidden areas in this hostile alien world. Check out our review of the game. LAS VEGAS – March 14, 2016 – Tom Happ announced today that he will be bringing his critically acclaimed game, Axiom Verge, to Xbox One and Nintendo eShop on Wii U later this year. Axiom Verge is a retro-style action-platform-exploration game done in a 16-bit style and was heavily influenced by games like Metroid, Contra, Blaster Master, and other classics, but with very modern design sensibilities. It also gives you power over glitches like those found in classic games, allowing you to scramble enemies, corrupt environments, and enter hidden areas as you explore this hostile alien world and uncover your role within it. The entire game (programming, design, art, animations, music) was created by one person, Tom Happ, during evenings and weekends over the course of 5 years. Previously released on PS4 and Steam, it has received more than 24 independent review scores of 9/10 or higher and won multiple game of the year awards.